If there is something that truly defines the ancient port city of Málaga it would be its vitality. Life bristles among classic examples of architecture like the cathedral or the islamic fortress and the mismatched facades that face the Mediterranean. The gentle weather makes is a meeting point for tourists from all over the world and makes it possible that in its luxuriant gardens and parks grow subtropical plants from the five continents that bloom every time of the year. Plaza de la Merced. The building in the left background is Picasso’s birthplace. It will be fun but hard work, as you will be enjoying learning and experimenting all the time, trying out different ways of drawing and mark making, sketching in watercolour and using colour in all forms without fear, sharing the work we do and discussing our findings intensely. 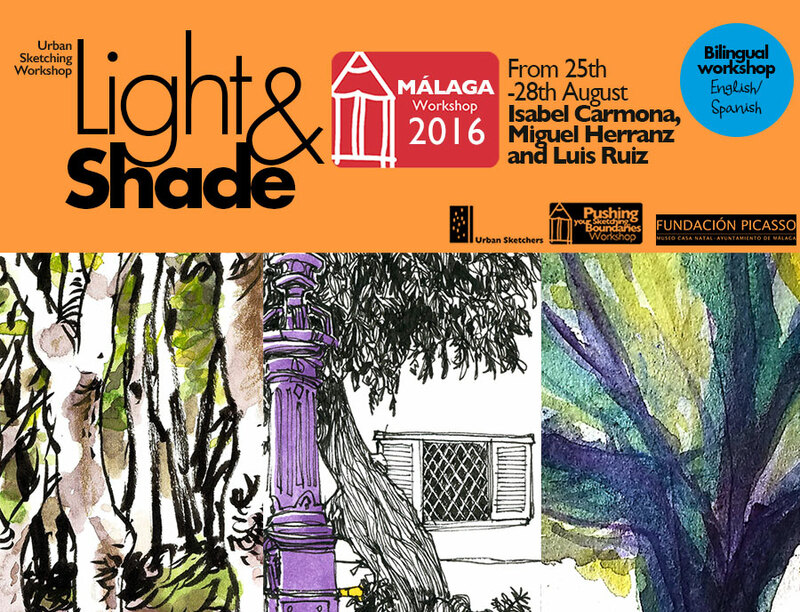 Each of the instructors will explore different themes of depicting Light and Shade in the context of urban sketching. 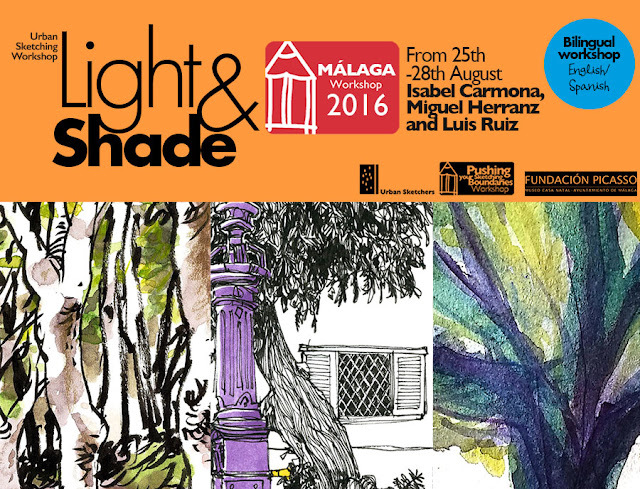 We will explore Malaga as a city in the sun, with strong light and shadow contrasts. This workshop will help people to simplify the complex architecture but not be shy about painting views that in the first instance might appear too difficult. And slowly building up the watercolour layers to add complexity and depth to our work, adding a variety of marks to the sketch to increase its richness. The aim of my workshop is to encourage the sketchers on working with line in order to find their personal handwriting to “write” their own tale of the environment or scene before them. On the first instance we will observe and experiment on how our hand is used to move and work on the paper to realise if its natural stroke is long or short, curved or straight, pushed or pulled. Once we discover how our hand works when left alone, we will try to use its natural way to influence our drawing. Secondly, we will focus on the elements that catch our attention and allow them to start our “tale” using them as a headline seed to let our drawing grow up as natural, free and personal as we want to. We will experiment with textures and colors to underline the actors of the scene, to separate planes on the stage or to add fun or drama to our story. The main tools of the workshop will be fiberpoint, ball or fountain pens for the line work and watercolors or color pencils for coloring. The southern sun of Málaga summer produces sharp shadows that can provide an effective and dramatic setting for the urban scene; alternating layers of light and shadow produce the required depth that usually envelopes human action, and let the spot be put on the place of our desire. The goal of the workshop will be building an adequate scenery and filling it with life. 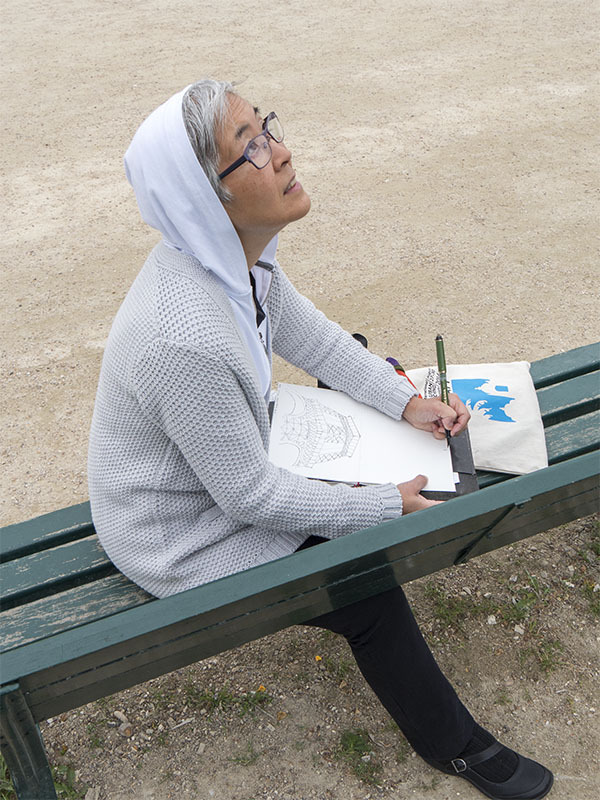 A successful sketch invites you in; it introduces elements that act as a ‘bridge’ between the observer and the drawing. As actors do, these elements enter once the scene is already set, thus it is important to follow some order while drawing and leave a chance for the magic to play a part once you have started. Because lots of things are going to happen after you start, things that can not be anticipated and that surely will enrich the result. Things that will tell us more about a place and a time, not a single instant, but a whole series of events that follow each other while you are drawing and that can all be put together in the same sheet of paper. Inviting you in: Making the observer part of the action portrayed and placing the focus on a desired place.. In addition, the shadows of different architectural elements makes buildings ‘sing’, it is just a matter of capturing the rhythm and putting it on the paper. It is much better than getting lost in the detail, keep it simple! Let the pen flow… feel the energy, who said that line is only useful for outlining? The tools required will be pen or fountain pen and a limited watercolour palette to enhance effects. Using and trying different watercolour approaches - line drawing with brushes, marker pens and watercolour pencils, painting with watercolours, using textures, light and shade, understanding colour. Welcome at the Fundación Picasso Málaga, Museo Casa Natal, Málaga, in our meeting space, in the evening at 6pm. 9.30am -10.30am Welcome at the Fundación Picasso Málaga, Museo Casa Natal, Málaga. 30 attendees maximum, 20 minimum. Any level of experience is welcome. A list will be provided for participants - we will be working with various drawing media, pencils, pens, watercolours and marker pens. To book - e-mail Isabel: isacarand@gmail.com for a registration form. Cancellation policy: All fees are fully refundable if cancelled prior to 25 July 2016. If cancelled after 25 July a £25 cancellation fee will be retained. In the event of too few registrants, all monies will be refunded. We are grateful to the Fundación Picasso Málaga, Museo Casa Natal of the Ayuntamiento de Málaga for their support and provision of the venue for this workshop. 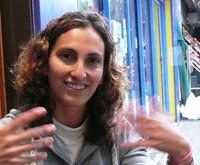 Isabel is Spanish but studied in UK where she practices as an architect and artist. Her passion is watercolour, easy to carry around and sketch on the go and likes experimenting and mixing media to get interesting effects. 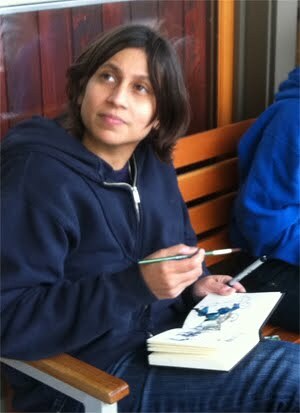 Isabel started sketching in 1993 as part of her architecture training and continues to this day. She joined Urban Sketchers Spain in 2011. As an artist she is part of West Berkshire and North Hampshire Open Studios scheme and joined the Oxford Printmakers Cooperative in 2013. 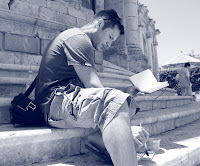 After a long career as advertising creative in Spain and Italy, Miguel becomes a freelance illustrator a few years ago. Working all day with digital media drove him back towards the live touch of the sketchbook that had finally grown to become his main medium of expression. Luis, as an architect, learnt to draw on location in his since the first year of his studies and has always found drawing the best tool to understand spatial relationships in his work. On the other hand, he has always carried a sketchbook during his travels as a more efficient way to record than photography. 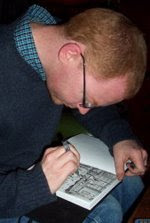 After finding Urban Sketchers, Luis discovered the pleasure of drawing outside with no preconceived objective and reading the USk manifesto, he feels specially sensitive to it, to the point of recording time and place, and he is transforming his sketching practice from single architectural sketches to understanding the city as a great stage where human activity takes place.